The Core Strength Bundle is on sale 40% off right now! I’m still having a great time using “The Core Strengthening Handbook” written by my pals over at Inspired Treehouse. It has cute little exercise cards, as well as one-page explanations with QR codes that link to a video of HOW to do the exercise correctly! 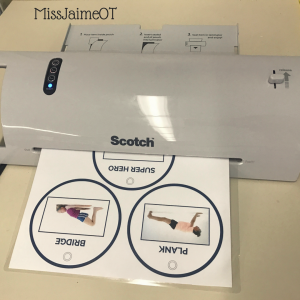 My new laminator that I am totally obsessed with – It’s only $30 bucks on Amazon and it works great! (and if you have Prime, which is the best when you need something fast, it’s free next day shipping!) 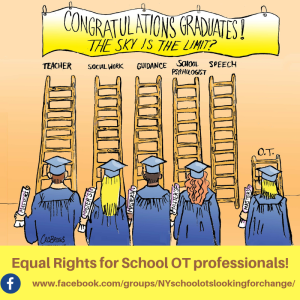 Click the image for the link. 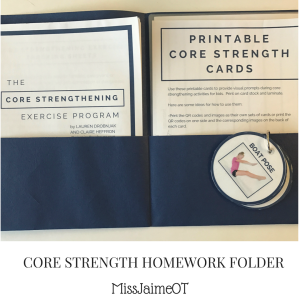 So after I printed out my Core Strengthening Handbook and Exercise Cards, I laminated them up! 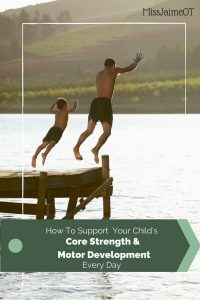 The Core Strength Handbook is one of my favorite ways to work on heavy work, postural control, and gross motor coordination. 2. 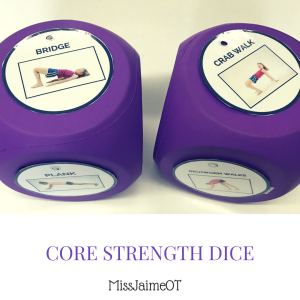 Core Strength Dice – I LOVE to use jumbo dice with my classes, they are so fun and SO versatile! I used these dice with whole classes as well in small groups and individual sessions. The kids take turns picking which die to roll, and whatever it lands on, we do! 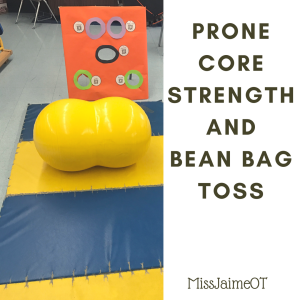 It’s a fun Creative Core Strength Activity! 3) Core Strength Memory Match! Use construction paper so the kids can’t see through the cards and “cheat”. 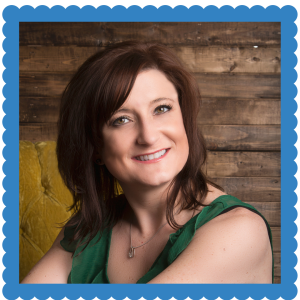 Put red on the QR cards and blue on the picture cards. The students turn over one of each card, and when they get a match, do the exercise. Again, the tracking sheets come in really handy because you spent more time exercising and less time playing memory. 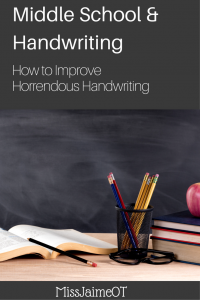 You could also use it the other way, and spend more time on visual memory if you want to address visual perception. 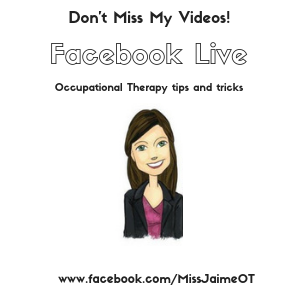 I like to use visual cues to help children understand where their body should be. 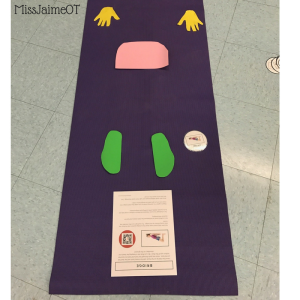 Foam pieces in different shapes can help children keep their body in the right positions throughout exercises. 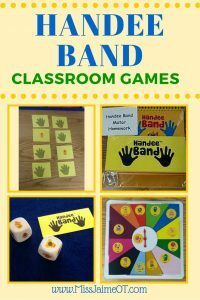 My kids loved the bean bag throw and the dice the best, but the parents really appreciated the homework activity, so they could help follow through. Parents often just don’t know HOW to get their child to exercise. 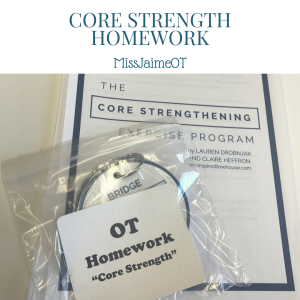 Having the program allows them to come up with their own Creative Core Strength Activities. The QR codes are a great way to get started because parents and children can scan and watch the videos on YouTube. Personally, my favorite part of the program is the exercise tracking sheets and the QR scanner pics. This really helped to motivate my little guys who don’t usually love to exercise. Keeping track of how far they could go or how long they could hold a pose was really motivating for them. And for my little techies, being able to use our school Ipad to “catch” the code and watch which exercise we get to do was super motivating. For grown-ups that are not too techie- just use any tablet or smartphone. Go to your app store and search for “QR scanner”. A bunch of free scanner apps with pop up. Download one, and you’re ready. 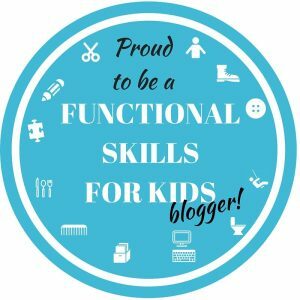 I’ve found that this program really works for all of my kids, regardless of their age, gender, or diagnosis. I’m excited because they just released a Hand Strengthening Program, too. Time to get my creative wheels turning and see what I can come up with! I’ll keep you posted! The Hand Strengthening Handbook is my next project! Warming that laminator up!